When life gives you bullace… you go straight to your favourite cook to see what she does with things plummy. 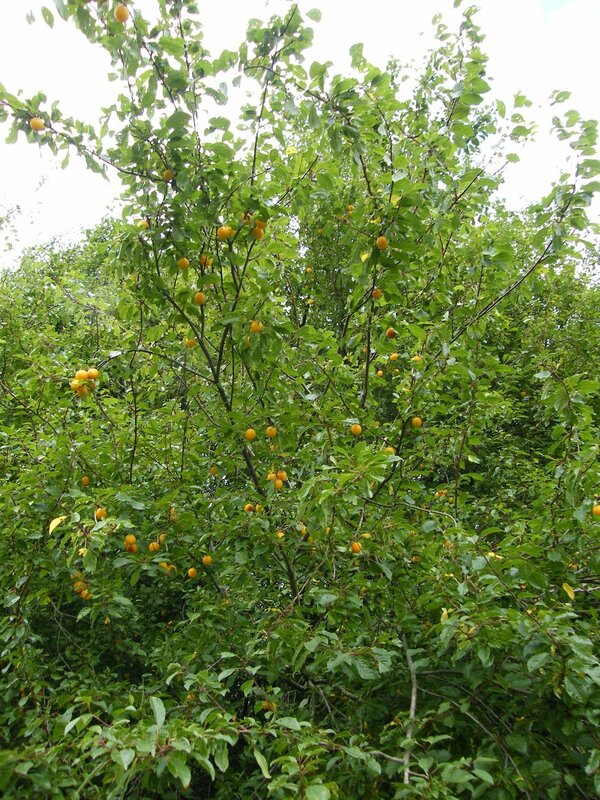 Bullace, for those who are in the same ignorance as I was until about ten years ago, is (or are) a variety of plum. When you find it growing wild it is well worth waiting for the fruits and then picking a lovely free ingredient. You might have to keep returning since the fruits ripen on a daily basis, replacing ones missed previously which will already be softening and browning. There appears to be no rhyme or reason to the location or quality of the annual harvest. This summer a neighbour’s tree produced nothing more than a dozen or so fruits which have fallen and been squished on the path outside. I decided to find out what was on offer in the spinney at the end of our road. And there was a tree dripping with yellow bounty. I went back for reinforcements from Mrs Cheoff and we picked about three kilos in no time. Time for the favourite cook. In my case, that would be Diana Henry who is a being of joy and loveliness in my life through her cookbooks, writings and broadcasts. I have made her ‘Damson Cheese’ over the last few years. Mostly with damsons. Occasionally with larger ‘ordinary’ plums. I once took my eye off the boil (sic) and transformed one batch from ‘soggy bottom’ to ‘burnt bum’ and had to bin it. The good efforts have always been greeted with approval, whether served with cheeses or as a fruity petit four. Diana Henry’s recipe is straightforward enough, and works for quince and damsons and plums. I ended up with 1200 grams of purée (I weigh my liquids) and added 800 grams of sugar. Whatever the fruit, it needs watching with the eyes of a hawk in the latter stages. Do that yourself if you do not own a hawk or if your local austringer* refuses to lend one to you. * Rather pleased that I have read the wonderful ‘H Is For Hawk’ by Helen Macdonald and am able to distinguish between falconers and austringers. The bullace we picked produced a purée much more liquid than previous plums and it reduced in a different way. The texture was not the same as the usual fruit ‘cheese’ or membrillo. That has a grainy quality which stands up to cutting and handling without leaving too much stickiness on knife or fingers. I managed to stop at a stage where caramelisation wasn’t so far gone that it would form a brittle, hard-crack on cooling. I poured it into a 25 x 18 x 2 cm cling film lined tray and quartered the slab after a spell in the fridge. Which is where the wrapped pieces have been returned. All I have to do now is to resist the temptation of pulling off chunks for indulgent, unshared treats. 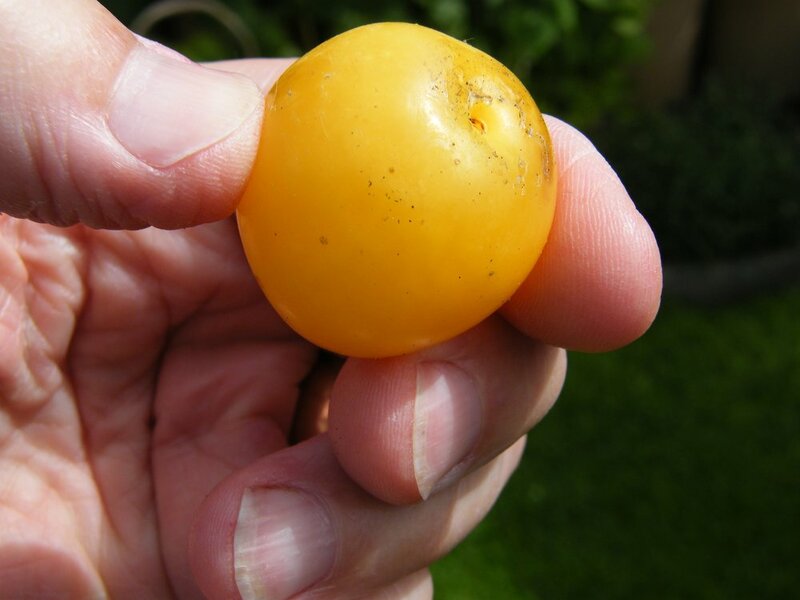 And the 'Golden Globe' for foraged fabulousness goes to... Yellow Bullace! Damsons are so nearly ready here in North Lincolnshire. A secret supply found somewhere or confirmation from a local greengrocer that deliveries are in will mean at least one more batch of this wonderful tracklement is made. I am more than happy with my sticky bronze jelly from bullace but the deep purple hues of damsons, like Diana Henry's recipes and her works, are a thing of seductive beauty. My silly notion that we might have enough of 2015's marmalade to keep us going was... well, just silly. A couple of days' effort, with lots more juicing, chopping, boiling and a little wiping of steamy windows, has produced the supply shown above. What follows is a final round-up of my 2016 marmalade activity. Last week I made precious jars of the marmalade master at Melrose & Morgan, Nick Selby's, lovely recipe... Plus that rhubarb and rose teabag jelly thing, of course. That just left a pile of Seville oranges to be dealt with. For these I deserted any books I have and internetted it for a while, coming up with this 'ultimate recipe'. I'm not sure about the tag. As long as I'm cooking, I'll enjoy the likelihood that 'ultimate' is out of reach, just around the corner... It helps in the struggle for perfection! The immediate difference to all previously made marmalade recipes was the cooking of whole oranges. Not that I hadn't done it before in another situation. Thoughts turned straight to Claudia Roden and, more specifically, to her glorious 'Middle Eastern Orange Cake' in Diana Henry's 'Crazy Water Pickled Lemons'. The recipe lured me into buying my first Diana Henry cook book... all others were quickly sourced or pre-ordered when announced. Setting point was reached quicker than ever before and in no time jars were filled and lids tightened. There were enough oranges to double the recipe so I decided to have another 'Marmalade muckabout' with the last batch. All was done as per the recipe but I introduced two flavours of my choice to the remaining juice and cut peel. Split into two smaller pans, I added powdered liquorice to one and crushed cardamom pods to the other. To give you an idea, I had 560g of juice and sugar for each before adding the peel. Tasting was dangerous as I was dipping into very hot liquid. Drips onto cold saucers told me when both were fine. The liquorice was just right, and remains so. It needs to be used sparingly, though... unless you are a full-strength addict. I used a rounded teaspoonful. The cardamom left its traces very subtly. I would use more than the dozen pods next time or, perhaps, just the seeds from as many. I set both types in mini jars as potential gifts. They are cloudy compared to the clarity of the 'straight' batch. The maslin pan is away now, waiting for summer fruits. The members of that opening photograph parade have all been safely stored. I continue to identify them using a roll of self-adhesive supermarket labels. The designs vary according to my whim. I'll keep adding copies of them to the LABELS album under the PHOTOS menu. With coloured pens out, I relaxed into a couple of hours' artwork. Nothing too developed but at least no sticky post-marmalade marks. Diana Henry... we meet quietly every Sunday in 'Stella' magazine and she gives me advice, inspiration and renewed pleasure whenever I take her down from a bookshelf. Melrose & Morgan... a modern grocery business with class, underpinned by lovely old-fashioned attitudes and a rather splendid book. Anna Koska... her lovely art inspired me to get out my fine liner pens and try to capture some fruity goodness on paper. Follow her @Twitter feed for work in progress. Claudia Roden... just take your pick from a woman whose Wikipedia page says bugger all about her wonderful wide-ranging achievements. Sous Chef... the home smoker, a Christmas present from my brother and his wife, came from here - as did that refined Italian liquorice. They have much that is tempting for every cook. It's just a few days after my last marmalade themed post. Since then I've sliced, chopped, squeezed and boiled to replenish stocks of my favourite complex three fruit marmalade. That remaining bowl of Seville oranges will be used for more jars of 'straight' tangy variety. 'Good Morning' Breakfast Marmalade complete. Next destination... Seville! The yield is a couple of jars down from normal. That was deliberate. At least, it was after I'd had my little thought. As I started the second batch I decided to take out two ladlesworth of sugary juice before the softened peel was added back. We are at the start of a glorious few weeks when forced rhubarb is making its appearance. Restaurants are grabbing supplies (tenderly, I hope) and adding this seasonal ingredient to their menus. Many will be offering a dessert with a blood orange sorbet or jelly. A panna cotta in place of custard might very likely be there as well. The rhubarb and orange combination is a classic which I have made in various forms over the years. But never in a preserve. Ah, no - I had none of the tender stem to hand. However, my wife's recent search for a different drink had come up with the infusion on show here. Those two ladles of reserved juice were boiled in a small pan until a set seemed likely... 106 °C on the thermometer and the consistency of a tiny sea anemone on a cold saucer. Just the one small jar in this trial run which then had one of the new tea bags dunked in while still very hot. When all was cooled, the bag was dragged from its sticky capture. The tasting revealed a subtle influence of rose and rhubarb. Very pleasing. Having made Earl Grey creams, I'm surprised it hadn't occurred to me before to make some sort of flowery, leafy tea additions to my jams and preserves. I'll repeat the process, trying other flavours and different amounts. It certainly works... But I leave it to you to discover just what best suits your taste. Go, Get Set, Ready?... Marmalade! Let me put this in context. What you are about to read was typed almost a year ago. The same season is now upon us and it’s time for the annual making of marmalades. I am still waiting for the complete mix of oranges and grapefruits to arrive at my local shops. This is a reminder to keep checking for availability so that you can stock up on supplies of your chosen jars of trapped citrus sunshine. Phew... I think I’ve made it by the skin of my teeth! Tooth skin was never going to be an ingredient though. It was blood oranges which were eagerly awaited. Their eventual local availability almost coincided with the disappearance of Seville oranges from the shops. But with the alignment of those two and the addition of pink grapefruit I had the holy trinity which forms the basis of my favourite marmalade. Turn to page 35 of this book and you will have instructions for the same marmalade… and the added bonus of Diana Henry’s reassuring prose. I make other varieties but this is the firm (I will leave that there) favourite. Oh, the setting point! I have learned to worry less and less about the final consistency of my jammy preserves. You eventually get used to the absence of rhyme or reason in the particular poetry of jam setting. This year’s first batch of marmalades was unsealed and emptied from its jars and brought back to the boil to be rescued from a totally unsettled state. It doesn't happen often and, in any case, I’d rather leave things on the less than sticky side. Too much bubbling will dull flavours and risks an embarrassing ‘burnt bottom’. Always better to under do things here. Go gently. I can't force anyone to make this but please consider what your reward will be for doing so. The punchy, bright fruit here is the perfect start to any day. You will break free of shop bought product and its predictable fight between bitter and sweet. Yes, this has those elements but they are so delightfully mixed that they form a serene marriage (with just the occasional argument for interest). I am always reminded of the luscious allure of candied peel or, better still, those glistening jewels of dessert fruits confits. This marmalade totally beguiles in the same way... fruits from another climate with great hits of juice, sunshine and 'Refresher' sweets. Sugary syrup is there too but all the while you have the grown-up but playful presence of bitter peel saying, "I'm coming to get you!" Pester your greengrocer for news of deliveries. Buy your ingredients. And take my advice. Make double quantities at the very least... unless you're prepared to suffer withdrawal symptoms two hours after breakfast every morning.